On the fifth day of our family holiday in Shropshire, back in July 2009, we visited the Monkland Cheese Dairy (in Monkland), and then went on to the nearby town of Leominster. The Monkland Cheese Dairy is a small cheese making operation that is open to the public, allowing you to see how they make cheese. They have a shop in the dairy, and also in Leominster and a couple of other towns. You can see their website here: Monkland Cheese Dairy. I did take some photos while I was there, but I didn't turn the ISO up high enough, so they're all quite blurry, so I haven't bothered uploading them to the website. Really I could do with a better high ISO camera, as the D200's not that great at high ISO (I was already using ISO800). Also in a couple of the images I have people's shoulders in the image (you're shown around the dairy as part of a tour with other people). It was quite interesting seeing the cheese making process, and all the maturing cheeses in the storeroom, covered with mould. The tour cost is currently £2.50 for adults and £1.25 for children. The tour doesn't last long, but £2.50 isn't too bad as entrance fees go. If you want to actually buy some of the cheese they make there though, expect to shell out quite a bit. After visiting the Cheese Dairy, we went on to Leominster. Leominster is a historic market town in Herefordshire, not far from the border with Wales. There are lots of historic buildings in Leominster, and you can actually see some of these in Google Earth (just make sure you have the 3D buildings layer turned on). As per usual, I used my fisheye lens to try and get as much of the view in as possible, bracketed my shots, and used exposure blending in my post processing to improve the dynamic range. Grange Court was originally built as a market hall for Leominster in 1663, but was dismantled, moved and converted into a house in 1859. 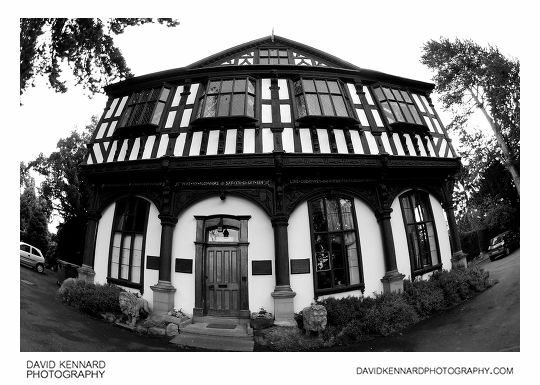 (Currently it is used as council offices). 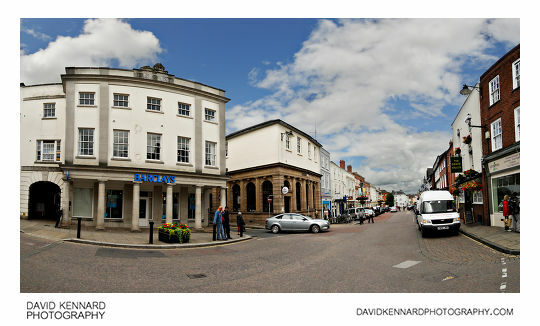 And here's the original location where Grange Court (the old Market Hall) stood, the buttercross. The buttercross is where Broad Street, Church Street, Drapers' Lane, High Street, and Burgess Street all meet. Drapers Lane is more like an alley than an actual street, I think you'd have a hard job getting a car down it. Here's a photo looking down Drapers Lane. 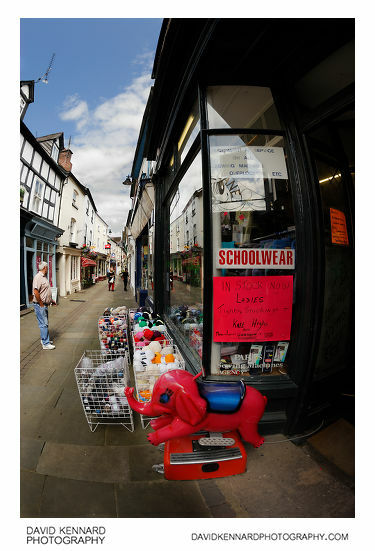 I guess the elephant ride outside the shop is so parents can leave their child on it while they look round the shop. The shop is quite appropriate to be situated in Drapers Lane. 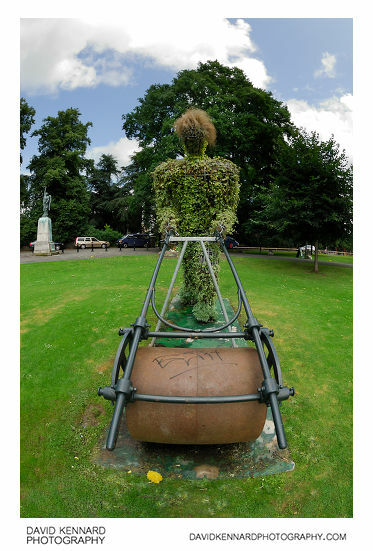 In the park where Grange Court is situated, there's this Ivy giant with a lawn roller, making sure the piece of concrete he's rolling is nice and flat. 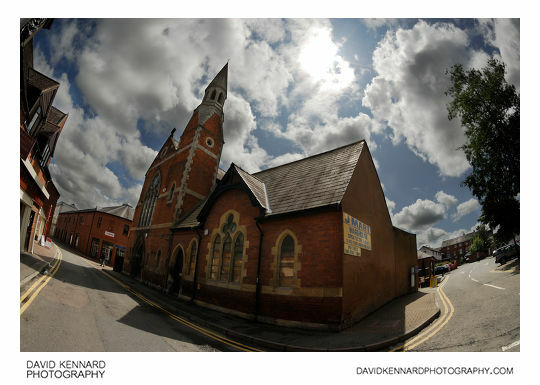 I found this church that's been converted into a warehouse shop quite interesting. 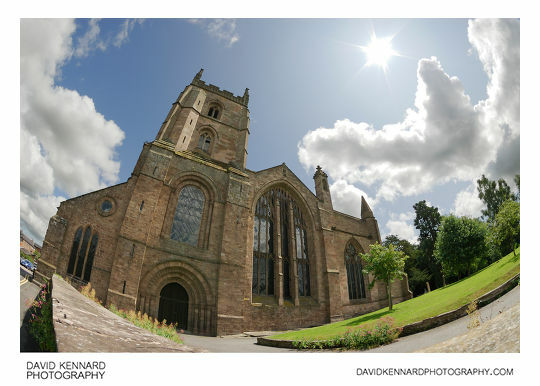 The main church (the parish church of St. Peter and St. Paul) in Leominster is still used as a church though. It used to be part of a priory that stood in this location, but the rest of the priory buildings (and part of the church) were destroyed as part of the dissolution of the monastries. Monastic buildings would either be taken apart and the different parts sold off, or they would just be burned down to get the lead used in roofs, gutters and plumbing. 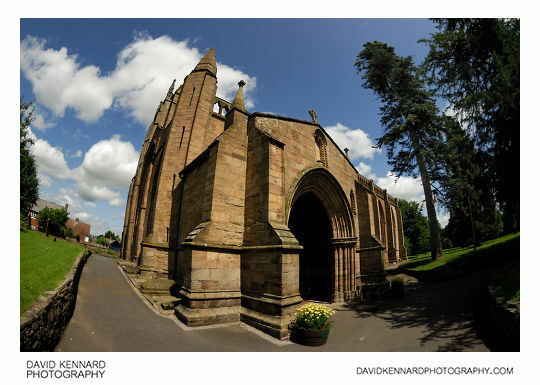 A short history of Priory Church is available at theheritagetrail.co.uk. 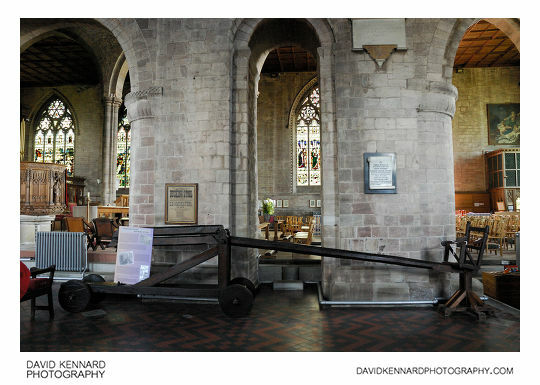 Inside the church is the ducking stool that used to be used to duck nagging women (amongst others) in the river Kenwater that flows through Leominster. After looking round Leominster we had a picnic lunch in a park near Priory Church, then went back to our holiday cottage for the afternoon. In the evening we went to see Flounders' Folly.